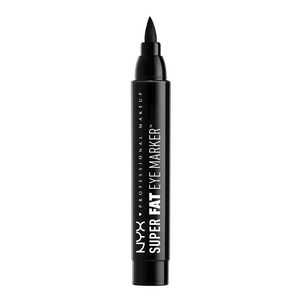 Heres a real magic marker: The extra wide felt tip eye liner is perfect for creating a dramatic cat-eye look. The eye marker application is smooth and the striking results are long-lasting. For most recent ingredient list, please refer to packaging. Water/Aqua/Eau, Butylene Glycol, Alcohol, Glycerin, Polyacrylate-16, Disodium Cetyl Phenyl Ether Disulfonate, PEG/PPG-14/4 Dimethicone, PEG-14 Dimethicone, Phenoxyethanol, Propylene Glycol, Dehydroacetic Acid, Caprylyl Glycol, Diethylhexyl Sodium Sulfosuccinate, Disodium Laureth Sulfosuccinate, Sodium Laureth-12 Sulfate, Pentaerythrityl Tetra-di-t-butyl Hydroxyhydrocinnamate. MAY CONTAIN / PEUT CONTENIR (+/-): Black 2 (CI 77266).